Who doesn't like chocolates!!! When you can make chocolates at home, then why to buy these from market. Chocolate making is really a very simple process. Collect few interesting mold and chocolate compound and your job is done. White chocolate - Cut small pcs of white compound in a microwave safe bowl and microwave for 30 seconds. Once done, mix the compound using spoon. Again microwave for 20 -30 more seconds. Mix the compound well to get a smooth creamy compound. Add ½ tsp oil in compound, if it gets too dry. Pour the white compound in any mold. Tap the mould for even distribution of compound. Keep the mould in freezer for 5- 10 min till set. Un-mold the chocolates. 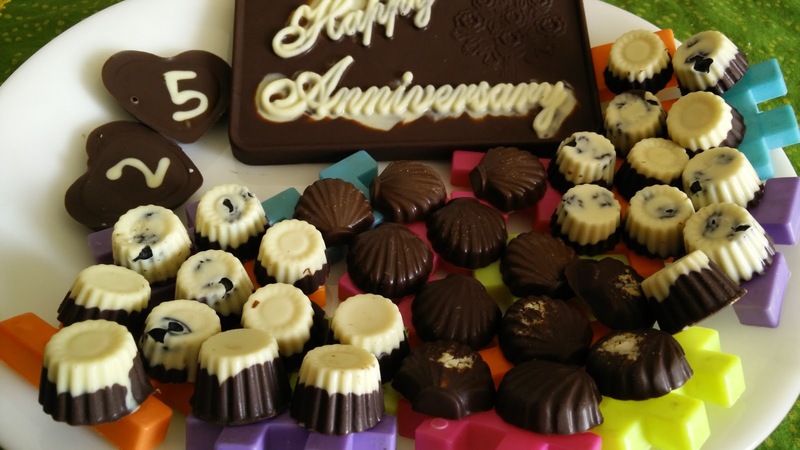 Brown chocolates – Follow the same procedure as above except add half quantity of both dark and milk compound in bowl to get medium dark chocolate. Marble chocolate – Add white compound first, top with dark compound in the same mould. Happy Anniversary – In a piping bag, add white compound. Pour white compound only in the written inscription. Allow it to set for few min in freezer. Top the mould with brown compound mixed with crushed nuts. Set in freezer. Once un-mould , t he written part will be highlighted on brown base. Raisin chocolates – Place 2-3 pcs of raisins at base and top with either of the compounds in different shape moulds.